How could you even think that the cooling of your morning coffee was up to the environment? It's Coffee Joulies's job. Those stainless steel coffee beans filled with “Phase Change Material” are popped into the coffee mug when served and they cool off the coffee in a very short time, absorbing all the excess thermal energy from the coffee. When the temperature reaches 140F, it starts releasing energy and keeps the coffee perfectly heated for hours to come. Cool, really; except the fact that they are $10 a piece. The ultimate everything: Keyport gives you a break from the rattling keychain s and the search for USB drives in the middle of work. It combines all types of keys into a compact and very awesome-looking handy device. Keyport's also got an USB drive, an LED light and a bottle opener. There's just one small problem, losing this one small thing would render the user completely useless. Look what they've come up with now! The inkless pen is made out of metal and would never run out of ink, well, because it hasn't got any. You can write underwater and upside-down with this thing. The writing cannot be erased however, and if you need a sharper tip, you can always polish the tip with sandpaper. The pen was made by Vat19, and will cost you around $28. There's a downside though: the metal scrapings that make up the writing is lead, and the pen strongly warns children against using it. Road rage has different effects on people. We Bangladeshis jump out of our cars and punch down the next guy we see, while in other places people might choose to endure it. If you are the ones who choose to bear road rage, this friendly looking device should be your friend. This thing says the meanest things about you, questions your manhood, and insults you to the point where you just hit it with all your power. It can be used for rage control in offices, homes and schools as well. It might not be the most comforting of companions, but smashing things is perpetually delightful. Popping bubble wraps are one the most joyful experiences we've ever had. What starts as unwrapping something soon turns into a popping frenzy; the worst comes when all the bubbles are popped. Those days are soon to be over as Thinkgeek brings us the Bubble Wrap keychain. This small keychain device holds eight pop-able bubbles and every time you press one of those, you hear a pop. The bubbles can be popped hundreds of times, and the fun stays. All for $4.99. Other than the fact that he's a fabulous writer and screenwriter, and is probably sitting on piles of money for his books, games and the brand new television show, there are two things you must know about George RR Martin before you commit yourself to reading A Song of Ice and Fire. The first is that he writes a LOT. Seriously. The series is populated by a large cast of characters, and the author has a backstory for each of them. The second thing you need to know is that he's a sadist. That's right; you heard it here first, and those who caught the controversial ninth episode of the television show will know exactly what I'm talking about. He'll punish you for liking some characters, force you to feel sorry for the ones you don't like, and in general keep you guessing. This has never been more true for the series than in the case of the third book, A Storm of Swords. 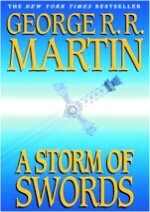 The longest book in the series to date, the paperback edition was split into two separate novels in the UK and four in France. It opens with the war; the aftermath of Stannis Baratheon's attack on King's Landing and the prelude to the Wildlings' assault on the wall, and, of course, the conflict between Robb Stark and the Lannister forces. And while the men are busy killing each other, or trying to, the women are trying to survive the consequences. Sansa is still subject to the court politics, which will have her betrothed to one person at one moment, married to someone else the next. Arya continues on the run from just about anyone and everyone, living in the rough, taking up new identities wherever she goes. Catelyn makes a desperate bargain to save what remains of her family, and loses the one leverage her party has. Daenerys Targaryen moves onwards in her journey to strange lands, seeking alliances, dealing with betrayal and loss. As is the case with the other books, the story is told through multiple perspectives, and weaves several separate plot lines into one narrative. There are twists and surprises aplenty, and lots of character development. There will be times you will want to hurl the book at a wall, only to go running to pick it up to find out what happens next. Martin keeps his prose clean and simple, and his dialogues, while badass, are easy to follow. Non-fantasy readers will be happy to know there's no high magic in here, no thunderbolts and lightning and talking horses, just plain action and intrigue. As we welcome the release of the much-awaited fifth book in the series, this is the book you don't want to miss reading. Just remember: don't get too attached to any of the characters.